The actuator of the new MSM CS from Schurter, available from Koloona Industries , is made of highly durable ceramic. The actuator material is resistant to scratches, abrasion, impact and chemicals. The new MSM CS switch with actuator can be provided with lettering and is light-transmissive. Equipped with these diverse properties, the switch opens up entirely new areas of application such as automation controls, building automation systems, construction equipment electronics, control systems equipment and display electronics. The non-illuminated version has a translucent white actuating surface. The standard or customer-specific lettering is black. Due to the base material and the lettering process, the lettering is resistant to scratches and to common cleaning agents, suitable uses include automatic doors and application specific control systems. 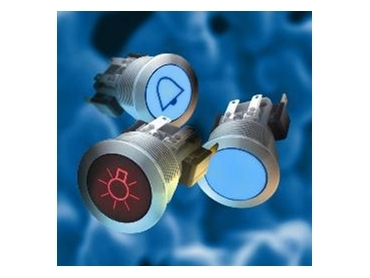 In the case of switches designed with illumination, the actuator surface of the switch fully illuminates uniformly. The standard black lettering provides a positive effect against the illuminated actuator, while negative lettering provides an inverse effect.